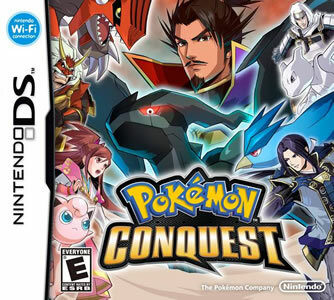 Released on Nintendo DS, Pokémon Conquest, also known as Pokémon + Nobunaga's Ambition, is a turn based strategy game and a cross over with the Nobunaga's Ambition game series, portraying the unification of the feudal Japan during the Sengoku Period. It is the first Pokémon game in this genre, featuring several Pokémon up to the fifth generation. 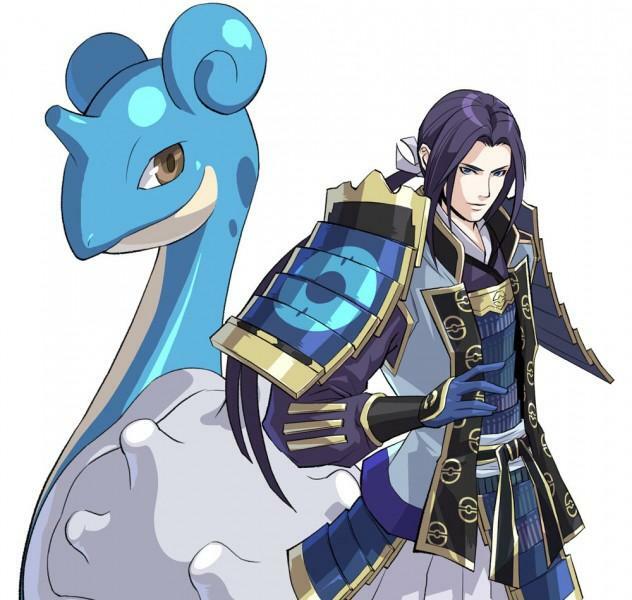 The game has a rather unique gameplay and storyline, where both Japanese Warlords and Pokémon work together to unite the divided Ransei region. The first news of Pokémon Conquest as an upcoming game was in the first volume of CoroCoro Magazine released in 2012 and an announcement at Jump Festa 2012. Later on the game was officially revealed during the Jump Festa 2012 event and it's official website launched not long after. Warlords and Pokémon unite to conquer the land! The story starts out with the player picking to play either as a male or a female then choosing a name for their character, who's the newest Warlord in the Ransei region and the ruler of the Aurora Kingdom. The region is divided into seventeen Kingdoms, where a Warlord governs each one of them. The region is also home of a legend that foretells the return of a mighty being that created the whole region, once it is finally united. After being mocked by the three Warlords Masanori, Mitsunari and Kiyomasa who find the player unworthy for such title, the underrated Warlord gets challenged by two Warriors from the Kingdom of Ignis. A girl named Oichi joins the player's side in the battle and together they beat the Warriors. She then entrusts the player with the responsibility of uniting the feuding Kingdoms, all while teaching them most of the game mechanics and tricks. The player starts by first conquering the three Kingdoms of Ignis, Greenleaf and Fontaine, in order, crushing their respective Warlords Hideyoshi, Motonari and Motochika. As the player progresses as a Warlord, they learn how to recruit other Warlords to team up with them, along with new wild Pokémon. They decide, next, to conquer the Violight, Chrysalia and Pugilis Kingdoms ruled respectively by Ginchiyo, Yoshimoto and Yoshihiro. Once that is done, the Kingdom of Illusio governed by Shingen and the Kingdom of Terrera governed by Kenshin, become available for conquest. As the player decides to attack either one of them, the selected Kingdom responds with an attack on the player's Kingdom, forcing them to go and defend it. 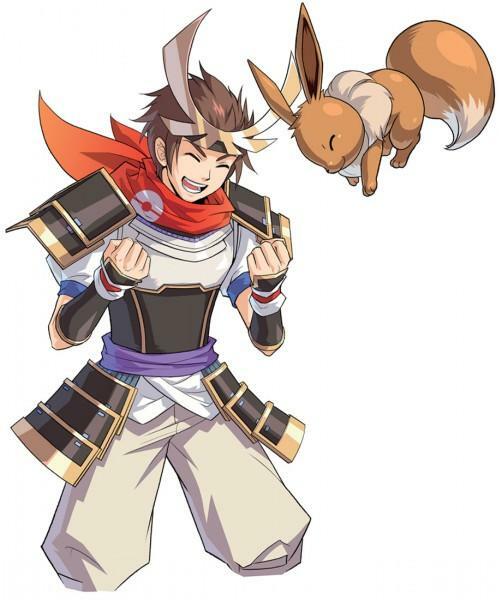 Succeeding in defending their Kingdom, the player transforms into a stronger Warrior and is now able to conquer one of the two Kingdoms, as both of them will Shingen automatically join the player's side once one of them falls. As Kenshin and Shingen join the player's party, the famous Nobunaga, who turns out to be Oichi's brother, appears and reveals that he too seeks to reunite the whole region under his supreme rule. The player continues to conquer the rest of the Kingdoms in the area and obtains throughout the process three evolutionary stones that can be used to evolve Eevee. Now that all the available Kingdoms are defeated, Ieyasu, Nō and Mitsuhide, who are Nobunaga's strongest Warlords, appear with their respective Kingdoms Valora, Spectra and Nixtorm. Beating them gives the player access to the last Kingdom, Dragnor, where the Nobunaga resides. With the final Kingdom under control, strange lights shoot out from different parts of the region toward a tower in Dragnor, where the player finds the legendary Arceus; the awaited creator from the legend. 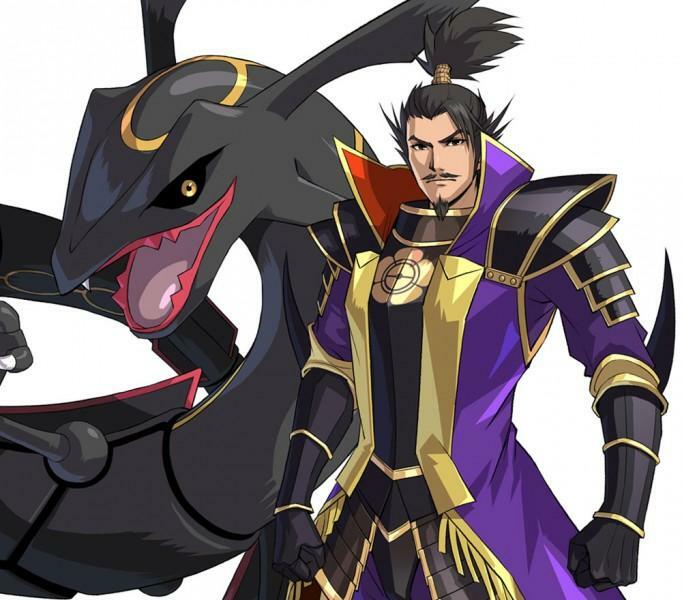 The player successfully links up with Arceus, but is then, once again, confronted by Nobunaga and four of his Warlord followers, revealing that his true motive was to get Arceus to appear and then defeat it. The real final challenge takes place between the player and the five Warlords, from which the player emerges as the victor and ultimately reunites the region and restores peace to the land. Arceus then disappears, stating that it is destined to meet with the player again. Completing the main scenario wil unlock Special Episodes, in the form of different smaller missions each with their own short storylines. Pokémon Conquest offers a variety of Pokémon from the first five generations, which the player can befriend and set as partners for their Warlords. Some of these Pokémon can only be obtained through special ways like the Swarm Pokémon and the Legendary ones. When there are wild Pokémon present on the battlefield, the player will notice a medal above them, which determines their compatibility and how much Link they can achieve with the current Warlord, whom Pokémon the player is moving. The medal's color refers to the degree of compatibility between the Warlord and the wild Pokémon. If they're compatible, the player can choose the link option, after getting close to them. This will trigger a mini game, where the player has to hit A, as each energy ball goes through the circle. Successfully hitting the button while the energy ball is in the middle of the circle will increase a gauge that needs to be filled up completely to befriend the Pokémon. The befriended Pokémon will then join the player's side, disappearing from the battlefield. Throughout the Special Episodes, the player might receive a notice of a weird Pokémon appearing in a new area, on one of the Kingdoms. The weird Pokémon will turn out to be a legendary one and the player has only one chance to befriend it, since it won't reappear again if the player fails. The game features a password system where they can different codes with which many Pokémon are unlocked. Unlike other games, where passwords unlock the Pokémon instantly, Passwords only make sure that the Pokémon's encounter or event will happen for sure. Once the Pokémon's password is entered, the player might get told about the Pokémon swarming certain areas. The game takes place in the Ransei region, a big island shaped like Arceus (which is actually its creator), filled with many mountainous areas and surrounded by sea. It is divided into 17 Kingdoms, each of them ruled by a Warlord that uses one of the 17 Pokémon Types. The player may befriend both common Warriors found randomly in the different Kingdoms and the actual Warlords ruling the Kingdoms. To befriend a Warlord, the player has to either defeat their Pokémon without taking from it, or defeat their Pokémon in 4 turns. Some Warlords would depend on scenario progression before becoming available for recruitment. In order to reunite Ransei, the player would have to defeat many Warlords and Warriors. When a character is defeated, they join the player's ranks and their Pokémon become available. 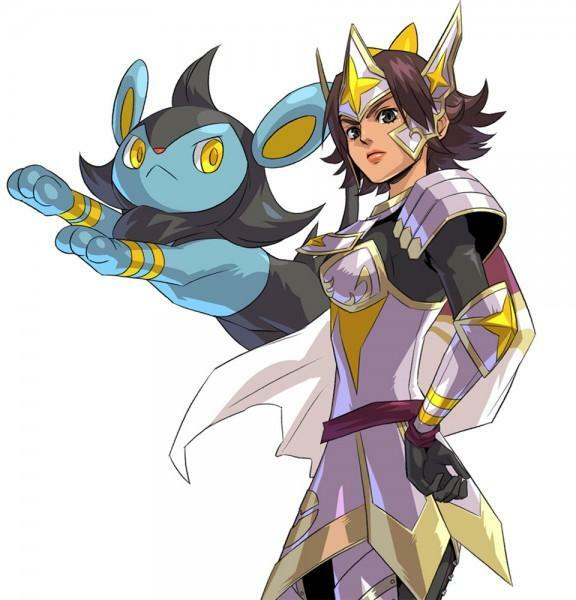 The player may switch the Warlords' Pokémon and try to find them better partners, having a Pokémon that can reach a perfect Link with the Warlord will allow them to be extremely strong, stat wise, and be able to evolve thoroughly. On the overworld map, the player have different functionality at their disposal, which increase as the game progresses. Any available area may be selected on the map, giving the player information about the Kingdom itself and their inhabitants. The player can enter a selected Kingdom, within which there are several sub areas, including fields, caves and wild areas containing wild Pokémon. There are also civilized places, where the player may interact with the citizens there, like the shop keepers. The Aurora Castle in the Kingdom of Aurora, the players home Kingdom. The battles take a turn-based strategy format, where players can use up to six Pokémon at a time, with their respective Warlords partners. Each Pokémon has only one move, instead of four, and mostly from their Pokémon type. The battles between Pokémon does still obey the weakness and resistance battle mechanics, featured in the main series. Moreover, Warlords too have abilities that influence their Pokémon during the battle, by increasing their stats or even helping them recover faster. To win the battle, all the opponent's Pokémon must be knocked out, or the player must reach their goal in the mission. Each month the player has one monthly action, with which they can do one of several activities. Aside from battling, the player may dedicate their monthly action to buy an item from the in-game shop. One should notice that browsing the shop without buying any item won't consume the monthly action. The player can also use the monthly turn to train the Pokémon, increasing their Link with their Warlord. A doctor might appear and educate the player about ranks, evolution and abilities. When a Warlord isn't used for a prolonged period of time, they might try to attract the player's attention by giving them a special item. A firework festival will start at the beginning of a new year, if the player has already found the fireworks item. The player might be informed of a legendary Pokémon's location. This only happens after finishing the main story. A merchant might sometimes visit the player, selling rare items. Random citizens will contact the player and ask them to help retrieving a stolen item. If the player doesn't attack an enemy Kingdom for too long, their strength will increase considerably. Sometimes, farmers might appear and ask for monetary donations. If you donate 5000, very rare items will be unlocked in the shop. If 2500 is donated, the player will get discounts from the shops in the region. If only 1000 is donated, the number of items sold by the shop will increase. Extreme weather conditions might hit the Ransei region, ranging from Snowfall, Rain and Heat which will respectively increase Pokémon moves from the Ice, Water and Fire types. 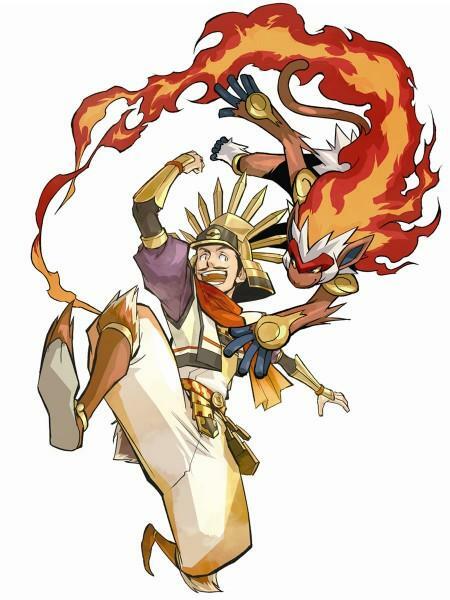 Both Pokémon and Warlords can evolve in Pokémon Conquest. For a Warlord to evolve, they need to reach the highest Link possible with the their perfect match Pokémon. When that is done, they'll undergo a transformation, changing their appearances and increasing their stats. As for Pokémon evolution, most Pokémon will evolve upon raising their stat levels to a certain amount, while others will require a different process. Certain Pokémon would need to have an item, such as the Metal Coat or Water Stone, attached to them and be used in battle. Others would require raising the Link percentage to a specific number. 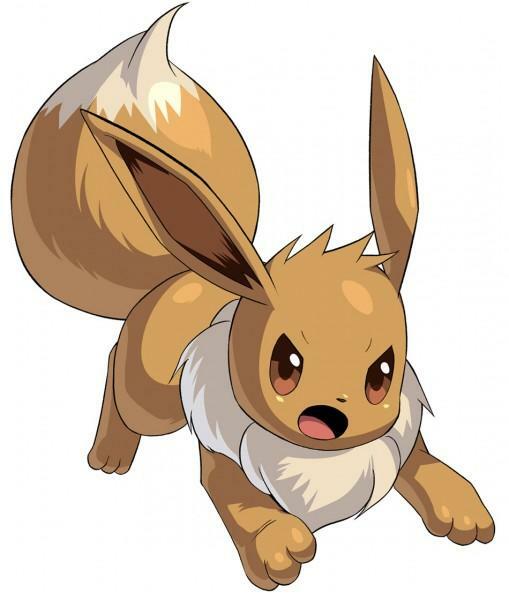 Furthermore, the player's starter Pokémon, Eevee, has a unique evolution process, as it can evolve into different Pokémon, depending on various conditions. To evolve Eevee, its Link should be raised a lot and then used to battle a specific nation. Eevee will evolve into a Pokémon corresponding to the type used by that nation. For example, if Eevee is used to battle a nation using the Ice Type, it will evolve into Glaceon, While using it to battle a nation using the Grass Type, will evolve it into Leafeon. They are the post game episodes, unlocked after defeating Nobunaga in the main storyline. The player will encounter many new Warlords within these missions, along with their Pokémon, which can be added to the player's ranks. Only 8 missions are available at first, and many more get unlocked as the player finishes them, reaching a total of 33 mission. The Rose of Ransei Unify 7 Kingdoms Finish " Not Worth Fighting Over (1)"
Not Worth Fighting Over (2) Unify 4 Kingdoms Finish " Not Worth Fighting Over (1)"
Not Worth Fighting Over (3) Unify 4 Kingdoms Finish " Not Worth Fighting Over (2)"
All Grown Up Unify the Kingdoms in the local area Finish "Tragic Determination"
Ransei's Legendary Beauty Unify 7 Kingdoms Finish "Tragic Determination"
The Visionary's Quests Befriend 100 Pokémon Finish "Happily Ever After"
The Reluctant Genius Unify 8 Kingdoms Finish "Happily Ever After"
Teaching Them a Lesson Unify 8 Kingdoms Finish "Happily Ever After"
Love is a Battlefield Unify 7 Kingdoms Finish "The Joy of Battle"
Land of Love and Righteousness Unify the Kingdoms in the location area Finish "The Joy of Battle"
A Ninja amongst Ninjas Unify 8 Kingdoms Finish "The Burden of Peace"
The Unparalleled Warrior Unify the Kingdoms in the local area Finish "The Burden of Peace"
Time for Battle! Unify 8 Kingdoms Finish "The Way of the Warrior"
Archenemies Win 5 battles Finish "The Way of the Warrior"
Blowing in the Wind Unify the Kingdoms in the local area Finish "Pride and Precociousness"
The Final Gamble Unify the Kingdoms in the local area Finish "Pride and Precociousness"
The Rebel The army of Nobunaga must be defeated before the 4th of January Finish "A Shroud of Darkness"
That Which He Holds Dear Befriend 40 Warlords Finish "A Shroud of Darkness"
This One Goes Out to My Fans Unify the Kingdoms in the local area Finish "All Grown Up"
Grace and Beauty Unify 8 Kingdoms Finish "The Unparalleled Warrior"
PokéMari & Me Befriend 40 Warlords Finish "Archenemies"
Putting the Books Down Befriend 100 Pokémon Finish "Blowing in the Wind"
The Dragon's Dream Unify the Kingdoms in the local area Finish "Blowing in the Wind"
I Want to be the Best Unify 8 Kingdoms Finish "That Which He Holds Dear"
Pokémon Conquest does also offer a multiplayer mode thanks to the wireless feature of the Nintendo DS. Player's may battle each other, with the Host being the one who manages all the match details, like the area where it will take place and the Pokémon Link limit. They may also choose whether they'll be attacking or defending, or they might also let it be randomly chosen. Videos from Pokemon Conquest including the trailer, TV commercials and opening/intro. 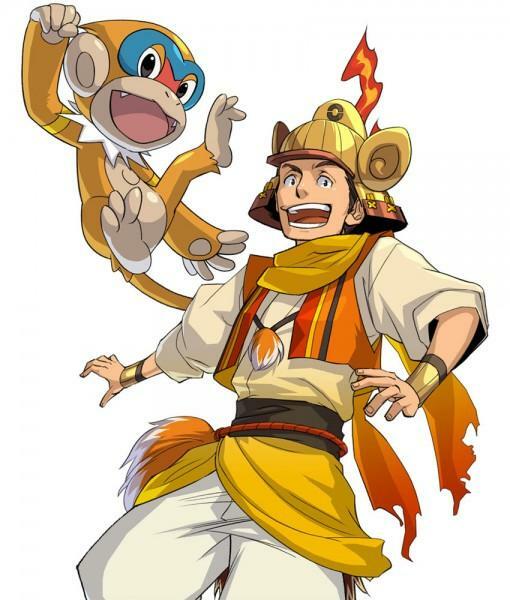 The perfect Link of Hideyoshi and Monfero is a reference to the real Toyotomi Hideyoshi who was often called "Saru", meaning Monkey in Japanese, as he resembled one physically. 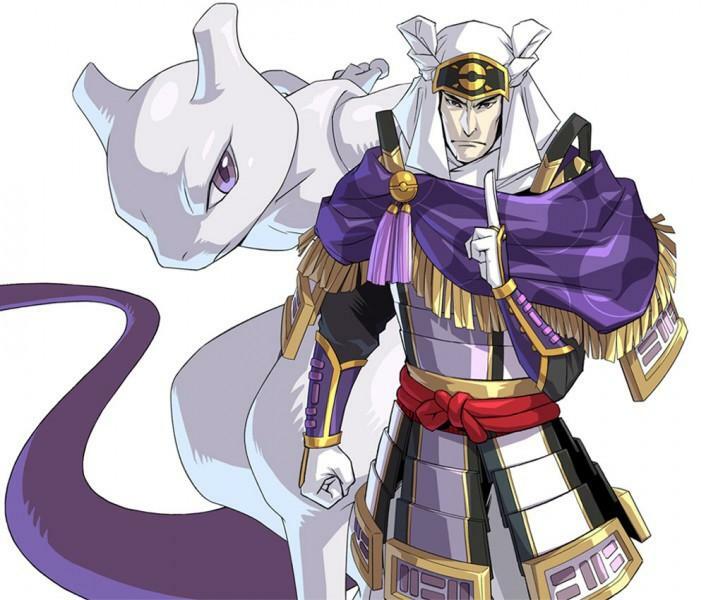 If Pokémon Conquest wasn't released, another Pokémon Crossover game would've been done instead, with the game Fire Emblem. The Warlord Hangei was given the lowest stats of all, referencing to the real life Takenaka Hanbei who was a sick man suffering of tuberculosis and dying because of it very young. Another reference is done in the game, at the end of his story, as he appears to be somewhat sick. Since "Hey You, Pikachu!" 's release, this was the only Pokémon game to be released in English and Japanese. Within three months of its release, the game sold 269 thousand copies in Japan, around 10 thousand in Europe, and nearly 244 thousand in the USA. The sales continued to rise, reaching a total of 368 thousand copies sold in Japan, 50 thousand in Europe, and almost 511 thousand in the USA, with a final global number of 1.02 million copies. Audrey Drake from IGN found the game very entertaining with its fun and diverse mechanics, rating it 9/10, the equivalent of "Amazing" on the IGN scale. Heidi Kemps of GameSpot also enjoyed the game, finding it quite unique and stating " Pokemon Conquest's concept and setting are unique, and the curiosity factor alone adds a good amount of appeal and fun to a fairly standard strategy RPG. ", while rating the game 6.5/10, which equates to "Fair" on the GS scale. 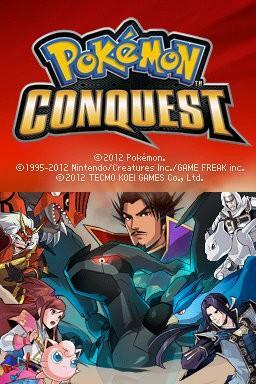 On GameRankings, Pokémon Conquest received a high score of 81.97%, over 29 reviews, while it scored 80%, over 40 critics. DetroitDJ reviewed the game on behalf of Pokemon Dungeon, and wasn't as impressed... scoring it 2 out of 5 stars. 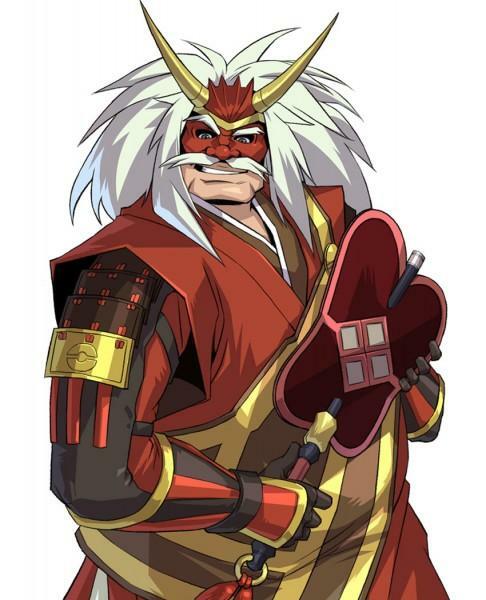 Overall, the game was one of a kind and successfully merged the worlds of Nobunaga's Ambitions and Pokémon, creating a game that would please (most) fans of both games.